I have been watching the Petermann Glacier ice tongue for some time now. Judging from historic maps and images, the normal behavior of the Petermann ice tongue was the formation of a concave front at the fjord mouth. Over recent years it has retreated. Much of the tongue is now detached from the walls of the fjord. Tidal forces will flex the tongue up and down: wind, currents and ice floe impacts will all exert at least a small lateral force on the tongue. It will continue to thin from melting. Judging by previous behavior and by the forces which will act on a more mobile ice tongue, I predict some dramatic calving this year. The image below shows red lines where I expect the tongue to calve. This is based on moraine and meltwater channels seen in other images from last year, and previous calving. Please note that this is more of an educated guess than a scientific forecast. Although there is a large fracture further upstream, it is quite old and may well be healed with solid ice. That part of the glacier is in compression across the fjord, which will - I suggest - reduce the likelihood that the fracture will grow - until it has move a substantial distance such as to relieve the transverse compressive forces. 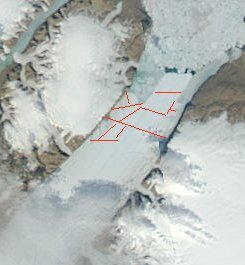 Projected breakup of part of Petermann glacier tongue. The Petermann ice tongue tip has held almost the same shape since winter 2008. It has had nearly two years in which to thin and crack. I would be very surprised if it does not retreat substantially this year. The Petermann ice tongue looks primed to lose a few fairly large floes any day now. There are a lot of cracks showing at 250m resolution. That means the cracks must be at least 250m wide. It looks like a few small bergs- about 2 or 3 km across - are going to break off before the main tongue breaks up. The bigger fracture back at the tributary glaciers needs a lot of back-pressure relieved before it can expand much. The latest cloud-free MODIS / aqua image shows that a substantial mass of ice has just broken off.